Hydraulic power units installed by Custom Fluidpower (QLD) for a truss moving equipment manufacturer have helped reduce risk of injury and increase workplace safety. A truss moving equipment manufacturer approached Custom Fluidpower to provide alternative power solutions for their equipment. Truss moving equipment is designed to eliminate the need for manual handling of truss frames, reducing the risk of workplace injuries. 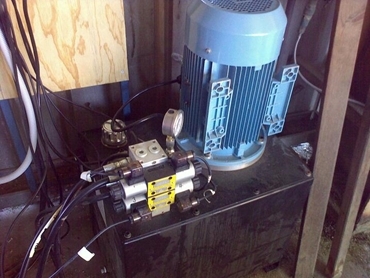 To further enhance the safety factor in the equipment, the manufacturer wanted to replace their existing electric power supply with a hydraulic power system. A key reason was the need to minimise risk of electric shock injury through operator error or use of tools made of conductive materials. The truss moving equipment was powered by an electric motor, which operated an electromechanical linear actuator. Custom Fluidpower replaced the electric motor with hydraulic power units, eliminating the risk involved with electricity by removing the power from the equipment frame in addition to facilitating better control. Custom Fluidpower installed a cylinder controlled by a rotary flow divider to replace the electromechanical linear actuator. The design and installation of the hydraulic power system has enabled the manufacturer to increase the safety of their equipment and also efficiency. Custom Fluidpower is a wholly Australian-owned company offering hydraulic, pneumatic, filtration and lubrication products in addition to complete system design, installation and commissioning as well as service and repairs. Custom Fluidpower services the agricultural, aerospace, exploration, industrial, marine, mobile, mining and material handling industries across Australia with their power solutions.